I so appreciate your willingness and desire to offer up your gifts to God in worship. I appreciate your devotion and celebrate your faithfulness--schlepping to church early, Sunday after Sunday, making time for practice mid-week, learning and writing new songs, and so much more. Like those skilled artists and artisans that God used to create the tabernacle (Exodus 36), you are willing to put your artistic gifts in service to the Triune God. So please receive this little missive in the spirit it is meant: as an encouragement to reflect on the practice of "leading worship." It seems to me that you are often simply co-opted into a practice without being encouraged to reflect on its rationale, its "reason why." In other words, it seems to me that you are often recruited to "lead worship" without much opportunity to pause and reflect on the nature of "worship" and what it would mean to "lead." In particular, my concern is that we, the church, have unwittingly encouraged you to simply import musical practices into Christian worship that--while they might be appropriate elsewhere--are detrimental to congregational worship. More pointedly, using language I first employed in Desiring the Kingdom, I sometimes worry that we've unwittingly encouraged you to import certain forms of performance that are, in effect, "secular liturgies" and not just neutral "methods." Without us realizing it, the dominant practices of performance train us to relate to music (and musicians) in a certain way: as something for our pleasure, as entertainment, as a largely passive experience. The function and goal of music in these "secular liturgies" is quite different from the function and goal of music in Christian worship. 1. If we, the congregation, can't hear ourselves, it's not worship. 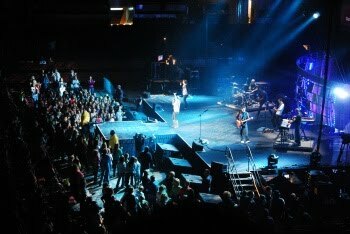 Christian worship is not a concert. In a concert (a particular "form of performance"), we often expect to be overwhelmed by sound, particularly in certain styles of music. In a concert, we come to expect that weird sort of sensory deprivation that happens from sensory overload, when the pounding of the bass on our chest and the wash of music over the crowd leaves us with the rush of a certain aural vertigo. And there's nothing wrong with concerts! It's just that Christian worship is not a concert. Christian worship is a collective, communal, congregational practice--and the gathered sound and harmony of a congregation singing as one is integral to the practice of worship. It is a way of "performing" the reality that, in Christ, we are one body. But that requires that we actually be able to hear ourselves, and hear our sisters and brothers singing alongside us. When the amped sound of the praise band overwhelms congregational voices, we can't hear ourselves sing--so we lose that communal aspect of the congregation and are encouraged to effectively become "private," passive worshipers. 2. If we, the congregation, can't sing along, it's not worship. In other forms of musical performance, musicians and bands will want to improvise and "be creative," offering new renditions and exhibiting their virtuosity with all sorts of different trills and pauses and improvisations on the received tune. Again, that can be a delightful aspect of a concert, but in Christian worship it just means that we, the congregation, can't sing along. And so your virtuosity gives rise to our passivity; your creativity simply encourages our silence. And while you may be worshiping with your creativity, the same creativity actually shuts down congregational song. 3. If you, the praise band, are the center of attention, it's not worship. I know it's generally not your fault that we've put you at the front of the church. And I know you want to model worship for us to imitate. But because we've encouraged you to basically import forms of performance from the concert venue into the sanctuary, we might not realize that we've also unwittingly encouraged a sense that you are the center of attention. And when your performance becomes a display of your virtuosity--even with the best of intentions--it's difficult to counter the temptation to make the praise band the focus of our attention. When the praise band goes into long riffs that you might intend as "offerings to God," we the congregation become utterly passive, and because we've adopted habits of relating to music from the Grammys and the concert venue, we unwittingly make you the center of attention. I wonder if there might be some intentional reflection on placement (to the side? leading from behind?) and performance that might help us counter these habits we bring with us to worship. Please consider these points carefully and recognize what I am not saying. This isn't just some plea for "traditional" worship and a critique of "contemporary" worship. Don't mistake this as a defense of pipe organs and a critique of guitars and drums (or banjos and mandolins). My concern isn't with style, but with form: What are we trying to do when we "lead worship?" If we are intentional about worship as a communal, congregational practice that brings us into a dialogical encounter with the living God--that worship is not merely expressive but also formative--then we can do that with cellos or steel guitars, pipe organs or African drums. Much, much more could be said. But let me stop here, and please receive this as the encouragement it's meant to be. I would love to see you continue to offer your artistic gifts in worship to the Triune God who is teaching us a new song. Update: See the new "Postscript" to this open letter. Postscript to "An Open Letter to Praise Bands"